In 1984 former players Paul McNamee, Charlie Fancutt and Pat Cash conceived a mixed-teams competition in honour of Davis Cup legend Harry Hopman. Born in Sydney, New South Wales in 1906 (died in 1985), Harry Hopman captained Australia to 16 Davis Cup titles between 1939 and 1967. As a player he won seven Grand Slam doubles and mixed doubles titles (several with his first wife, Nell), was a member of the victorious Australian Davis Cup team in 1939 and reached the singles final of the Australian Championships three times. The Hopman Cup is named in his honour. In 1970 Harry Hopman left for the USA to conduct a series of tennis camps. Lucy Fox married Harry in 1971. She travels to Perth, Western Australia, in January each year for the Cup. After receiving the endorsement of Mrs Lucy Hopman, the inaugural Hopman Cup was played at Perth’s Burswood Superdome in 1989 with Cash and women’s world No.1 Steffi Graf as the headline acts. The invitational tournament became an official ITF event in 1996 as its standing among the players and in the tennis community grew. 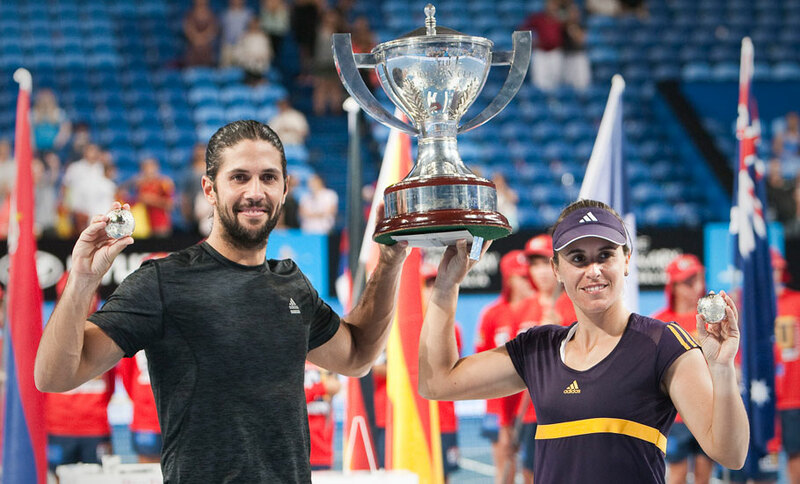 In the tournament’s 25th year, the Hopman Cup first showed at its new home at the newly constructed Perth Arena. I attended the Day Session on 3rd January 2013 with my sister for the scheduled play of the U.S.A. versus Spain. However, John Isner had to forfeit the game, due to injury; and to the pleasure of the Australians in the mostly Australian audience, 16 year old Australian, Thanasi Kokkinakis, filled in for John. I have to say the Perth Arena stadium was quite spectacular to walk into. It is a huge and a beautiful venue with air-conditioned seats and retractable roof. The complex itself is very well organised with toilets, Food outlets. and Coffee kiosk, Merchandise stalls, and even Bars set up at every 2nd block or so. The million dollar Perth Arena, Western Australia’s landmark home of live entertainment, music and sports, opened in November 2012. We sat in the Gold seating area across from the Chair umpire, Row H seats 9 and 10 right in the centre. Luckily we were just under the edge of the roof not directly under the open area, as some people in front of us unfortunately had birds going past and dropping little “legacies” onto them !! A hat would have come in handy for them. There wasn’t a lot of time for going out to get something to eat or drink between matches. The queues were pretty long wherever you went, but perservance, or maybe hunger, paid off. If the games had resumed, the officials closed off the doors with chains and you had to wait until a longer pause between two games (like at a change of serving end) before you could go back to your seat. Click here for the official website and for past results. UPDATE: JAN. 2018 – The past results can be found at the ITF page here. A detailed Timeline or History can be found by going to the Hopman Cup website here. I loved watched Venus Williams for the U.S.A. playing. To me, she was like poetry in motion. Yonug Bernard Tomic and even younger Ashleigh Barty for Australia did very well as the Round Robin results show, and it is a shame I thought, that they didn’t get to the Finals. However, it was exciting for me to see Serbia as one of the Finalists, because I love the Serbian players – Novak Djokovic and Ana Ivanovic. I really like Tommy Haas from Germany also. Our Bernard Tomic even beat Novak Djokovic at the Australia versus Serbia game on 2nd January 2013. You can see some of that match at this You Tube link here. 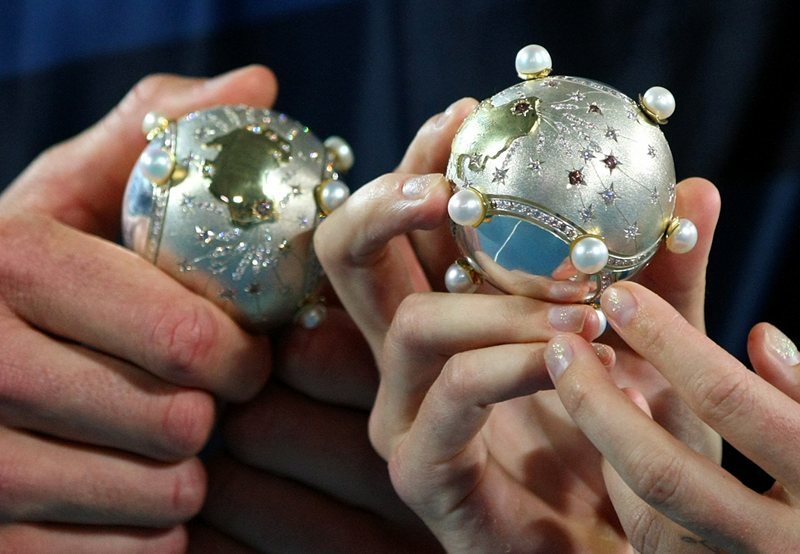 Doris Brinkhaus of Brinkhaus Jewellers designed the Brinkhaus Hopman Cup Tennis Balls trophies for the winners. Made to the real-life size of a tennis balls, the trophies are made of sterling silver, plated with 18 carat yellow gold, and encrusted with over 200 diamonds jointly donated by Brinkhaus Jewellers and Argyle Diamonds. “It’s special to us, we enjoy creating it because it’s out of the ordinary and the players really appreciate it,” Doris said. “They are now widely considered to be one of the most sought after tennis trophies in the world. Champions Steffi Graf, Boris Becker, Serena Williams, Lindsay Davenport, Roger Federer, Mark Philippoussis, Martina Hingis, Monica Seles, Arantxa Sanchez Vicario, James Blake, among many others, are all proud recipients of the prized Hopman Cup Tennis Balls” says Doris. 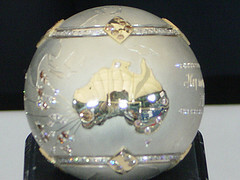 Jewellers started on the 2013 Hopman Cup trophy in May 2012 and worked on it for a few days here and there to get it completed by mid November. The total prize money for the Hopman Cup is one million dollars. Then, of course, the winners are presented with the huge perpetual Prize Cup also, which has their names inscribed on it. 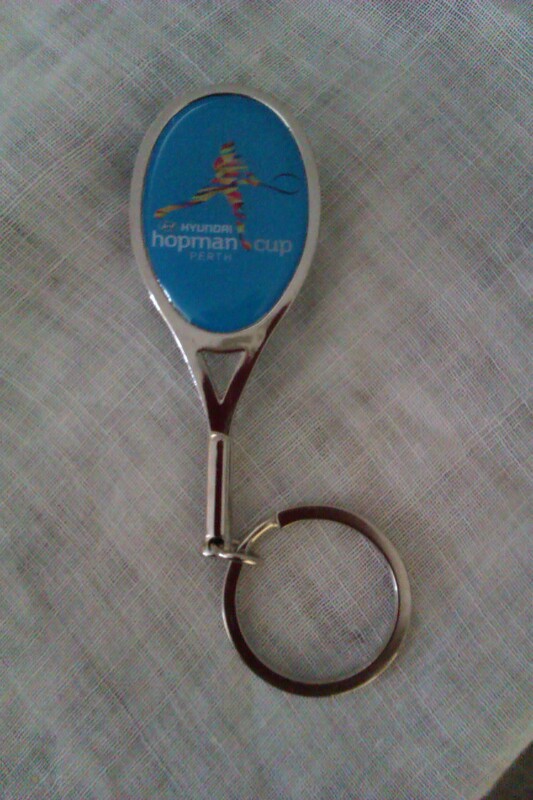 Below is a photo of the Official Hopman Cup 2013 Programme (which cost $10) and a tennis racquet shaped key-ring with bottle opener that I bought for a souvenir. I’m looking forward to watching the Australian Open in Melbourne running from the 14th to the 27th January 2013 on television. The Australian Open is one of the “Grand Slam” or major tournaments, the others of course being Wimbledon, the U.S. Open and the French Open. Australians love the Hopman Cup, especially Perth people, whom have had at least the Hopman Cup to call “their own.” Or is it? I went to the Hopman Cup in 1999 at the Burswood Entertainment Complex, when Australians Mark Philippoussis and young Jelena Dokic won the Hopman Cup. I actually went to watch the Spanish team because I really liked Arantxa Sanchez Vicario. Sadly, Hopman Cup founder and tournament director Paul McNamee has been axed from his long-running management role at the Perth exhibition teams event. McNamee played a key role in the founding of the Hopman Cup tournament in 1988. He served as Tournament Director of the Hopman Cup and Chief Executive Officer of the Australian Open until 2006. McNamee, a former professional player, had a 24-year association with the tournament he co-founded. He gifted the Hopman Cup to the International Tennis Federation in 2002 with the understanding that he would remain tournament director, handing over the ownership rights in order to receive the international body’s backing, which he believed was important to the tournament’s survival. “We all know Tennis Australia has wide tentacles and I think the disappointing thing is their antagonistic behaviour towards the event since 2007,” McNamee said. 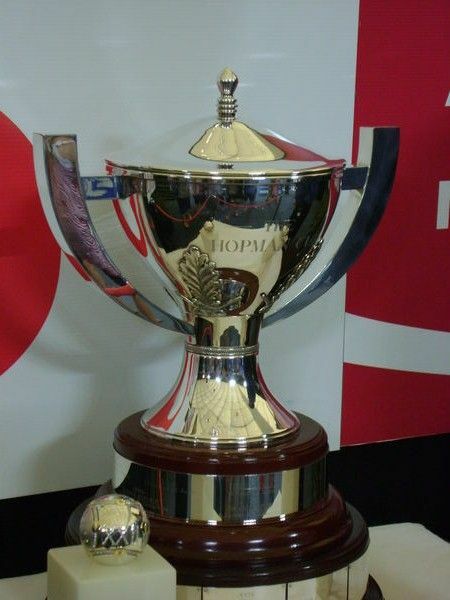 Let’s hope that when Tennis Australia takes over the Cup, that it keeps the Hopman Cup going, and keeps it in Perth. The Perth Arena website states that Tennis Australia will return the Hopman Cup to the Australian Open Series. The Australian Open Series is a selection of tennis tournaments held annually prior to the start of the Australian Open in Melbourne, Australia. As of 2013, there are five official Australian Open Series tournaments held across Australia in preparation for the first Grand Slam of the year, as designated by Tennis Australia. Tourism WA chief executive Stephanie Buckland told The Sunday Times that Tennis Australia had vested interests in rival tournament the Brisbane International which is run simultaneously and said the State Government had “concerns” it would jeopardise the Hopman Cup continuing in WA. “As a major sponsor of the Hopman Cup, Tourism WA wants the best outcome for Perth, and has some concerns as Tennis Australia also runs the Brisbane International at the same time as the Hopman Cup, and this could pose a conflict of interest” said Buckland. Tennis Australia has poured millions of dollars into the Brisbane International, which also operates in the first week of January. Hopman Cup assistant tournament director Rob Casey told The Sunday Times a Tennis Australia takeover meant the Perth field, which has drawn 24 world No.1s in its history, would never be as strong again. 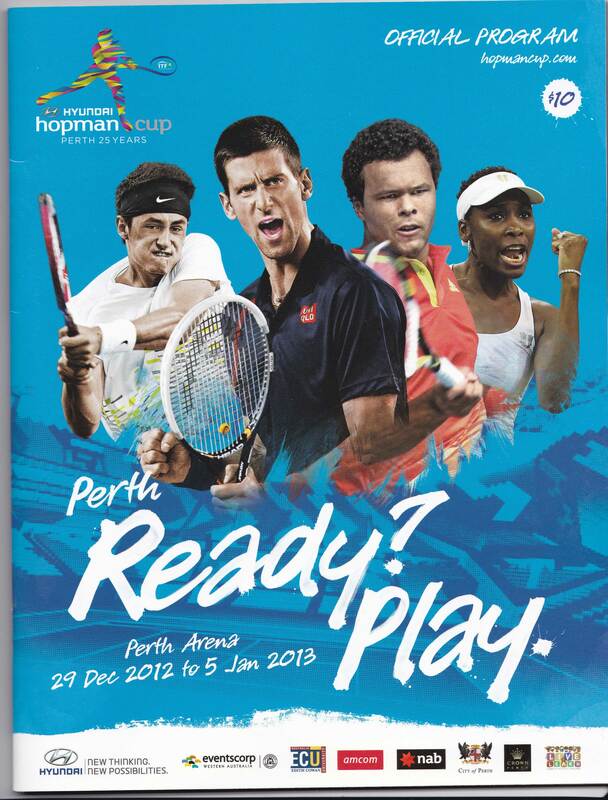 This Perth Now article explains the threat to the Hopman Cup continuing at all after 2014 or 2015. Please stay tuned to the options and possibilities, and support the continuation of this great tennis tournament, especially please support it continuing to being held in Perth !!! go to my 2014 post ! Did you know that it was Pat Cash who suggested the Hopman Cup be held in Perth? ?